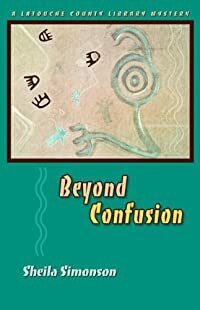 Beyond Confusion by Sheila Simonson: Synopsis and Online Purchase Options. Synopsis (from the publisher): The 2008 election is over, and librarian Meg McLean is thrilled that the library levy passed. In spite of an economy in free-fall, Meg's personal and professional lives are thriving. Tribal Chief Madeline Thomas of the Klalos offers an inherited farmhouse for a branch library — but the farm was owned by a relative of Meg's rival and vengeful enemy, library administrator Marybeth Jackman, who plans to contest the will. Disasters begin to strike — the farmhouse is vandalized; the chief's home is firebombed; and when Marybeth falls to her death, Meg becomes a murder suspect. Echoing Marybeth's malice, pro-censorship protestors violently attack the county's bookmobile. Meg and her romantic interest, Undersheriff Rob Neill, must confront religious zealotry, bullying, and troubled mother-daughter relationships to penetrate the morass of bad karma and a maze of crimes.